Yet more wet weather is forecast for parts of the country in the coming days as our tumultuous spring continues. Western areas will receive the bulk of the rain, as weather systems arrive from the Tasman Sea. Rain is delivered to eastern parts of the North Island today, while a ridge of high pressure brings settled weather to much of the South Island. MetService Meteorologist Peter Little commented, “Gisborne Airport received 28mm of rain in the 24 hours to 11am Thursday, which after three weeks of relatively dry weather will please local farmers”. A new weather system muscles its way onto New Zealand on Friday. A period of rain or showers is forecast for the south and west of the country, while eastern areas should remain mostly dry and warm with blustery northwesterly winds. On Saturday, it’s a showery start to the school holidays for most, but as a narrow ridge of high pressure moves onshore many places should receive long periods of sunshine during the afternoon. 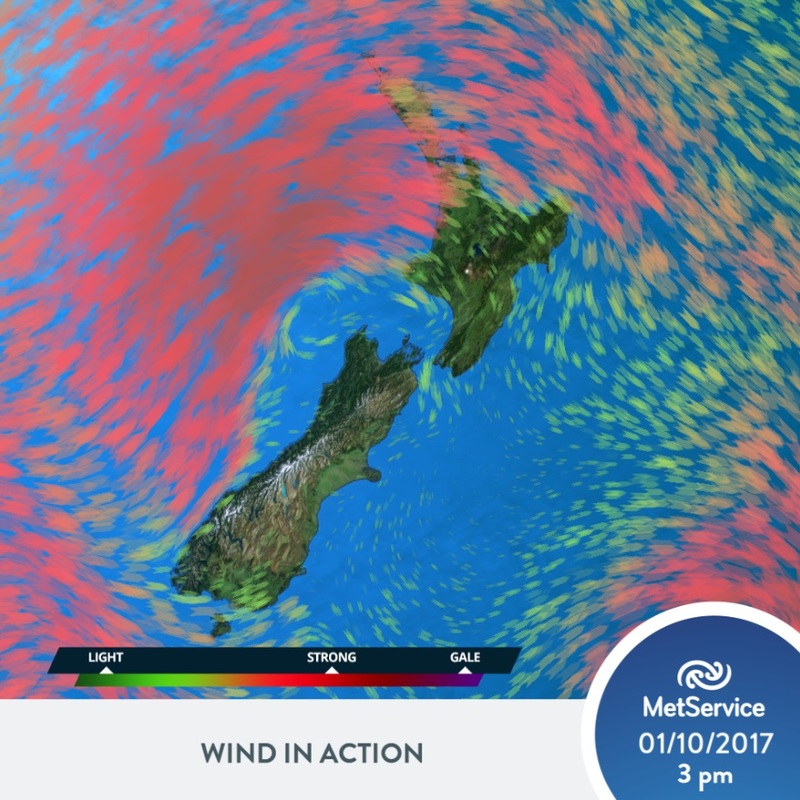 “Make the most of this fine weather, as another weather system will usher in rain and wind across much of New Zealand on Sunday”, added Little. Once again it’s those folk in the west that will need coats and gumboots handy on Sunday, as a strong west to southwest flow becomes established over the country. “Westerly gales are likely in exposed parts of New Zealand on Sunday, and these strong winds will make for trying conditions on the final day of the New Zealand Womans’ Open at Windross Farm Golf Course in Auckland”, commented Little. Wind forecast for 3pm on Sunday. Image from Weatherscape.